Oh, the Turing books. I love it when authors can come up with truly unique characters. These books revolve around a computer–an artificial intelligence based computer named Turing. Throughout the books, Turing explores her dawning self awareness, and how this complicates her existence. Each individual book has some sort of mystery–murder, embezzlement, scams–that Turing and her small group of human friends must try and solve. The stories themselves are pretty run-of-the mill, with criminals doing crimes that are eventually discovered through clever police work and a considerable amount of processing power. However, the interplay between the characters (several of which are computers themselves, and Turing is always trying to discover if these computers have become self aware also) and how a newly self aware computer explores her new world. I cannot say enough about this book (you don’t know what you’re talking about Ben!). I first picked up this book when I was in 6th grade, and I’ve made a habit of reading it every few years since. To me, this is the epitome of adventure fantasy. It has it all–an unlikely hero, daring fights, a seemingly insurmountable evil, and just enough humor to take the edge off. The book is second in the Dark Is Rising series. I liked the first, but not nearly as much as this. The story is of a young boy, Will, who on his 11th birthday finds he is an immortal with an important mission: to unite the signs and turn back the rising evil. The story chronicles his self discovery and mastery of his powers, and the ultimate fight that results between light and dark. What I especially like about this book is the lack of sugary “good is good and bad is bad” themes that are often present in books of this type for younger audiences. This book has loved ones working for the dark side, and good people doing evil things for the sake of the light. It’s a well written, complex story that is a great introduction into the world of fantasy adventure. One part has especially stuck with me since the first moment I read this book. A member of the Dark enters into Will’s house on Christmas morning, in an attempt to capture Will’s soul. The Dark has the ability to read surface thoughts, so throughout the whole visit, Will thinks hard about the coming breakfast, instead of the number of secrets running through his mind. As the Dark man leaves, he mentions to Will’s family that they’d better feed him, because he seems to be very hungry. Ever since then, I’ve found myself mildly worried when I’m punching in a password or typing in my pin number. I mean, what if a member of The Dark is around to read my thoughts? So I always think another number while I do it, just in case. : ) Ah, books that stay with you–what more do you want? Ah, silly little mysteries. This is one of the books I picked up off the new mystery section, and you can just tell by the title that it’s going to be a stereotypical silly little mystery. This one had it all–female main character who has nothing to do with law enforcement (she runs an herb shop in a small town) who gets roped into the mystery and does all the solving. It was really unmemorable–the only reason I even remember that the woman was an herbalist is because my mom loves these books (she’s an herbalist) and I remember that there was something to do with dill pickles because of the title. Ah well. I’ll probably read the rest of them…it’s still better than reading romance novels. 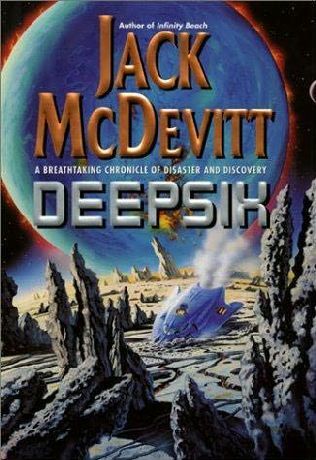 This is the second book I have read in Jack McDevitt’s Academy Series, about 24th century humanity and their experiences in space exploration. It is also the second book, chronologically. This one is about a planet about to be swallowed up by a rogue gas giant, and the people who try to learn what they can from it before it’s gone. Of course things don’t go according to plan, and drama ensues. Like the other books in the series, Deepsix is not for you, if you are not a fan of the genre. It can get bogged down in pseudo-sciency detail, and the swashbuckling adventure sequences can get a little repetitive at times. But I really like the picture it paints of future humanity, and McDevitt has a real gift for imagining alien worlds and creating engrossing stories in which to explore them. This is a children’s book, so I am reviewing it as if I were a kid. Adults will find this book charming, but aren’t likely to want to read it to themselves. It would probably rate a 2/5 for an adult. If I had to guess (though I have no expertise in this area) this book would appeal to any grammar school aged kid. The younger kids would likely need help reading it, and the older kids will race through it, but it should be entertaining for most. The book is about a family of porcelain dolls who have lived in the same house for 3 human generations. The dolls don’t age, and if they’re caught acting alive (for example moving around or found in a place they weren’t left) they cease to be alive (temporarily if the infraction isn’t major). The story involves a minor mystery, and the premise is fun. Who hasn’t enjoyed a story about live toys? I actually enjoyed it myself, though I wouldn’t think many other adults would. Its a bit younger than the Velveteen Rabbit, I think, and it feels much less sad since the dolls accept each new owner without feeling the loss of love of the old owner. Its a very simple story, without the more adult themes of loss and love that the Velveteen Rabbit has. This is a group of short stories by a variety of mystery writers that all center around food of some sort. An interesting collection, and at the end of each story there’s an interview with the author and a recipe for the food that was featured in the story. Some of the stories are really good, some not so much. So I guess this is like all other short story collection except this has a SLM flavor. I like Stephen King. Yes, he’s a bit long winded. Yes, there have been times I’ve just flipped through 20 pages of descriptions thinking “Ok! I get it!” I thought this was one of his better works. A school teacher is in a horrific accident that leaves him in a coma. He comes out of it several years later to discover he has the gift of foresight. And his girlfriend married someone else. Bummer. He foresees calamity when he touches a lowly state representative, and dedicates his life to stopping the apocalypse he sees coming. Now a TV show! I like the book better, but the TV show is very, very good. I guess I’m just a book person. This book is just full of witty banter, but that is really all that makes it interesting. Have you noticed that there is a lot of witty banter out there? It’s like the editors all got together and forced their authors to attend a witty banter workshop and they must prove the publishing companies didn’t waste their money by filling every page with something that makes the reader go “hee!” Anyhow, it was witty. And banterful. That’s a word, shut up. However, that is all that is actually memorable about this book. In fact, I picked this book up a day after I finished it and had to check my book list to see if I had read it all ready or not. A SLM that is a bit worse that most of them. This one takes place at a writer’s convention where someone, you guessed it, gets murdered. Of course, this is a convention of mystery writers…who in their right mind would commit murder among those who write the most interesting murders in novels? I bet their next crime takes place at a forensic convention. Oh, don’t worry, it gets solved in the end by our heroin. She’s amazing in an unimaginative and unmemorable way. It’s like I was on crack this month and I don’t quite remember any of the books I read. However, I do remember this was a good book, nice and short and full of intrigue. Read it. A SLM in hardback, this is the story of a doctor who goes to Prague and looks for his sister. He finds his niece instead and must look for his missing family members. Insert generic SLM storyline here. It was OK.
A sequel to The Stairs in the Chimney, The Door in the Tree continues a year after the last book left off. The children are back for the summer and continue their adventures in a mysterious wood. Take the story from the last book, change the chimney to a tree and throw in slightly wiser children, and you have this book. Enjoyable, yes. Memorable, no. One of those books in the “female fiction” genre that is so popular now-a-days. This is about a woman who craves a change from her boring, unloved life and moves to Australia for a bit of a working vacation. She stays in the vacation house of a rich acquaintance and hooks up with a pair of gay underwear designers. These designers proceed to instruct her on how to deal with re-meeting the love of her life and what it will take to dump him before he dumps her. It ends as you might imagine, so I won’t spoil it for you. (Hint: have you ever watched a chick-flick? Imagine that plot line: happy to funny to romantic to tragic end to miraculous reuniting). A fun, easy read for a vacation or a beach trip, but not one I’d keep in my collection long-term.